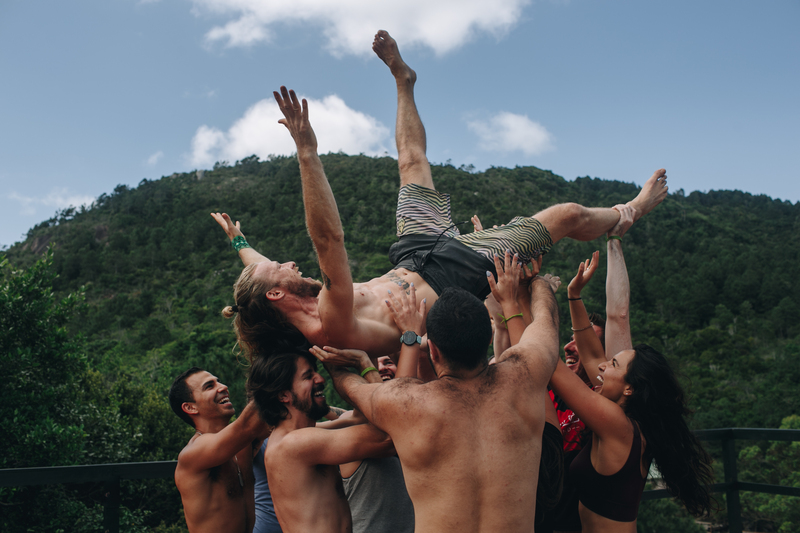 Jasmine shares what she learned living in a community on the other side of the world to home, outlining her top 8 lessons on how to thrive in big groups and new places as a sensitive soul! I’m an empath which means I can be really sensitive to other people’s emotions and sometimes everything just feels a little bit too much! I’ve had my own personal ups and downs in life and had many different moments of complete overwhelm. Empaths are wired to be more sensitive to the subtle parts of existence, processing everything deeply from someone’s facial expression to the environment around them. This can lead to us becoming emotionally overwhelmed more easily due to feeling everything and anything. I decided to challenge myself by spending 3 months living and working in a community on the other side of the world to home. Change can be difficult but I was determined to build emotional resilience and experience adventure. The week before my flight I had a panic attack and was convinced I had to cancel my ticket to stay put within home comforts! But growth isn’t comfortable and it is through pushing the comfort zone that important discoveries are made. When I first arrived to Rosemary Dream community, in Brazil, my first night was spent at the Family Dinner event which can sometimes have as many as 80 people eating all together! At first I had no idea who to talk to, where to sit and was completely intimidated by all the bubbly, outgoing people making jokes and chatting away. There was so much noise and activity that I felt like a shy little mouse who wanted to retreat into the corner and take a nap! As the weeks went on, I started to come out of my shell, make connections with others and find my place in this new environment. Having my role as the yoga teacher in the community really helped me to feel at home, as teaching yoga has become such a big part of my life. At times it could get overwhelming being around so many people and living far away from what’s familiar to me but it taught me a lot about myself and how to manage challenging situations out of my comfort zone. Empaths can be introverts or extroverts but either way we tend to need to take time out alone to regroup and recharge. This was especially important to me when sharing my living and working space with so many different people. I loved connecting with everyone but it was absolutely necessary to take time to myself every day. Making time to ourselves a priority is something that we can all do to manage our energy levels. As much as time out is important for empaths, when moving to a new place it’s also beneficial to take part in community events and activities to get out of the head. We can be prone to overthinking or getting into thought cycles of worry. This is because we process information on a very deep level, which can be great for personal reflection and creativity but can also lead to downward spirals of anxious thinking. I was working, taking part in activities and pursuing my own projects whilst living in the community so there wasn’t the time to sit around worrying! As empaths, honestly we can find life a little bit exhausting and can get tired easily. Sleep is important for everyone but I feel like I need more sleep than a lot of my peers in order to function well. Living in a community there is always something fun going on and I really had to learn not to get FOMO and take myself to bed when I needed to rest. Living in a new place, it can be important to be sociable to get to know the people around you but we can’t do everything and being tired only exacerbates the challenges of being an empath so be sure to get enough rest. Empaths can feel tension deeply and take criticism to heart. Living with a lot of people is amazing practice for this. It helps to learn not to take things personally and to deal with constructive criticism with open communication. If ever there were tensions between people around me, I learned how to not let it negatively impact my own mood by taking a step back when I wasn’t involved. Learning not to take things personally is key for empaths to survive in group living situations. As empaths we are deep thinkers, interested in the big questions in life. We love to think about the why and how behind everything. We are completely fascinated by the nature of human existence and the world around us. Living as part of an international group I found myself with the opportunity to connect to other people like me, who were also asking the big questions. I’d really encourage any empaths who have moved to a new place to connect to others in this way, whether it’s by going to a philosophy talk, a yoga class, or linking up with local social impact projects. In the community I was encouraged to express myself fully and authentically share myself. The space felt very supportive and non-judgemental giving me the freedom to worry less about what others might think of me. For empaths who can be overly sensitive to what other people think, it’s really important to practice putting ourselves out there. You can do this in small ways like talking to a stranger on the bus, sharing your poetry with a trusted friend or opening up to someone you might not have thought to be emotionally vulnerable with. Because empaths can be especially worried about conflict and feel extra sensitive to any kind of disagreement, they can sometimes be prone to trying to please others to avoid conflict. Living in a community helped me to realise how important my own needs are and that mostly, other people react very well when I’m clear on my needs. I don’t have to do what I think other people want me to do. I can respect my needs and be clear about them with others. To survive in a new place, it’s essential that empaths understand their own needs and know how to communicate them to others. You can practice this with people you feel comfortable around first, even if it’s just over the phone to your mum and then start trying to be clear about your needs with new people too. My whole life I’ve found it difficult not to absorb the emotions and energies of people around me like a sponge. Empaths have a strong sense of the moods of others and can sometimes be hyper aware of the people around them. Living in a community I had to be really careful not to feel everyone else’s emotions as my own, and instead learned to allow other people the space to feel their own feelings without absorbing them myself. For a lot of people change can be scary. Throughout my life, I have learnt that no matter how terrifying the thought of the unknown has been, the more I push myself out of my comfort zone and explore new things, the more I realise I’m stronger than I thought and can do more than I gave myself credit for. Of course, sometimes it’s also really important to stay within the comfort zone for a number of different reasons so it’s all about finding that delicate balance between effort and ease. Jasmine is a yoga teacher and writer from the North East of England. She's currently travelling South America, learning Spanish along the way! She's passionate about sustainability, meaningful work, connecting to others and learning more about well being practices from around the world. Ever been called ‘too sensitive’?